Q: What does your company do? 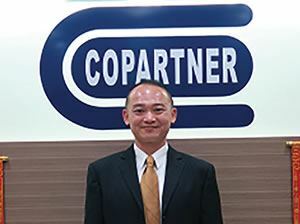 A: Copartner Tech Corp. is a leading, globally wellknown manufacturer of bulk custom cables and wires. We produce our lines of wire and cable for industries that include medical, automotive, green energy, industrial and consumer electronics. Q: What is your role there? A: I have a leadership role in marketing and sales growth, new product development and being a total solution provider with a strategic mindset. I also seek to inspire team members to achieve the goals we have set. Q: What do you like best about your position? A: I welcome stress and challenges as they motivate me to work harder to provide solutions. I strive to remaining calm during such times as it allows me to focus on ways to better solve problems that come our way. Q: How has your industry most changed? A: The world continues to become more wireless, but the key is that one still needs a cable to make that happen. It is important for us to be part of this trend if we are to survive. We have been excellent in using this approach in consumer electronics, and we are now striving to make similar advances in other fields— such as medical, automotive, green energy and industrial cables—in the biggest part of our business. Q: How does your company remain competitive? A: By being the first to know a customer’s major requirements, and being their handyman whenever they need our support, care and assistance.